“Could not connect to net.tcp://localhost:1500/policy” the basics. After all the hassle with ADFS and the WAP servers that had been on too long. I got this error message on top after a restart of the ADFS server. This error message also took a while before I had found it out. I encountered this error message because I used a PowerShell cmdlet for ADFS. This does not mean that this cannot solve the problem at other times. No idea if it only occurs on Windows Servers, but my solution is for a Windows Device only. Lets fix “The connection attempt lasted for a time span“. The message comes up because your firewall is blocking something. As you can see in the error message: “net.tcp://localhost:1500/policy”. Your connection tries to go over port 1500, but the server blocks this on purpose: “No connection could be made because the target machine actively refused it”. In my situation I turned off the firewall to see if this was my issue. In a production environment you can do that as well temporarily, but make sure to turn it on again. Go to start and search for Control Panel. Open Turn Windows Defender Firewall on or off in the left menu. 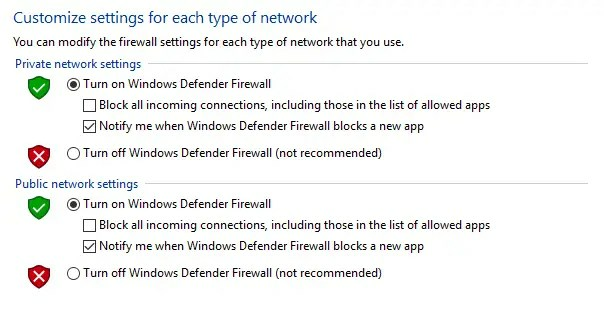 Select Turn off Windows Defender Firewall (not recommended). TCP error code 10061: No connection could be made because the target machine actively refused it. Try to make a connection again. Do you have a different solution, or do you have feedback, or other ideas? Let me know in the comments. vely refused it [::1]:1500. ,Microsoft.IdentityServer.Management.Commands.GetEndpointCommand"